When it comes to the tech sector, all the action — certainly all the innovation — is in America, right? Amazon’s retail transformation has made Jeff Bezos the world’s wealthiest person. Google and Facebook dominate the Internet. Apple devices are as ubiquitous as Microsoft software. As New York Times columnist Tom Friedman told our Wharton Global Forum in Hong Kong in June, the last decade has been truly revolutionary. 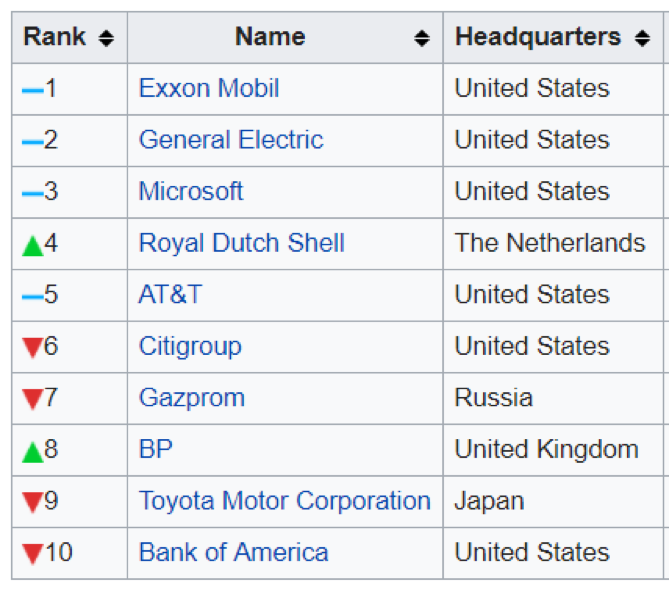 Just look at the 2007 vs 2017 data on the world’s largest public companies (updated by Wikipedia at the end of Q2 2017). 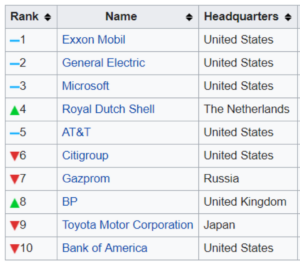 A decade ago, Microsoft was the only tech company in the top 10. 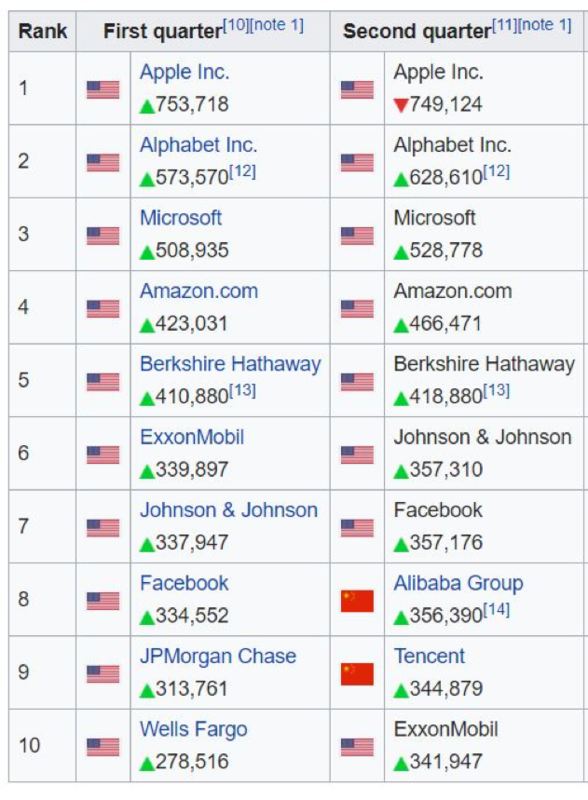 But there are actually seven tech firms in the global top 10 now — the other two are Chinese: Alibaba and Tencent. In China, everyone knows “BAT” (Baidu, the Chinese Google, along with Alibaba and Tencent). There is much less BAT buzz outside China, for two reasons. First, the Chinese government’s “great firewall” around the internet not only restricts the flow of information in China, it also helps protect Chinese firms from international competition. Second, the Chinese tech companies have tended to be rapid adopters and adapters of innovations generated elsewhere rather than breakthrough inventors themselves. The first point continues to hold: “techno-nationalism” is a new term of concern in the West when it comes to China’s aspirations to chart its own course to global prominence in technology, by protecting the domestic market and always with a close eye on the IP of others. But the second reason for discounting Chinese tech — that they are incapable of creating true innovation — is rapidly receding as a viable criticism. Anyone who ignores Alibaba and Tencent does so at their own peril because of real innovations they are implementing in China, and what they hope to do globally tomorrow. I am not thinking of the fact that more goods move through Alibaba’s platforms than Amazon’s — even though that’s the case (in terms of their value). Nor that Tencent’s WeChat is Facebook, FaceTime, and LinkedIn all rolled into one — also true. Both facts probably have more to do with the scale of the Chinese market and the distinctive habits of Chinese people than Chinese innovation. 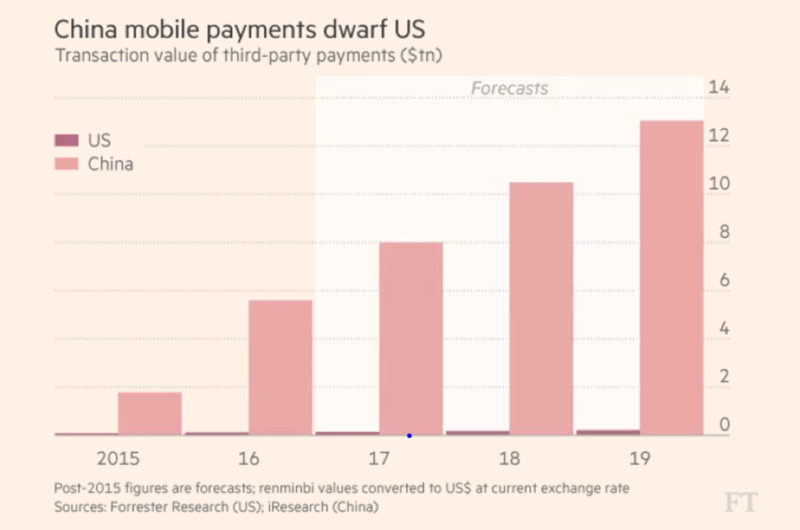 Rather, I am most struck by China’s massive lead (literally 50 times the U.S.) in the world of mobile payments — an area where most people expect dynamic if not revolutionary change (towards a cash-free society) the world over in the coming decade. The title of the graph below from the Financial Times says it all. When it comes to Alibaba, think less eBay meets Wal-Mart and Amazon, and more fintech. For Tencent, think less social media and e-sports and more fintech. Four hundred and sixty-nine million people made online payments in China in 2016. A larger number used phones to pay in offline retail stores. For comparison, the user base of Apple Pay, by far the dominant American player, was 12 million in the U.S. last year. I am now used to seeing people in China paying for everything from taxis and coffee to clothes and meals with either WeChat (Weixin) Pay or Alipay (Zhifubao) — another world from the China of the early 2000s when you had to pay hotel bills with a series of 100 RMB notes. This new world was brought home to me at a breakfast I attended a few months ago in Shanghai. It was the birthday of someone at the table. To celebrate, someone wanted to send “red packets” (hongbao) to everyone at the breakfast. This is an age-old Chinese tradition — stuffing different amounts of cash into red envelopes to celebrate a special occasion, with the surprise of seeing what you got. Of course, there were no (physical) red packets on the breakfast table. Only a lot of smartphones, all with the red packets app on WeChat. Apparently, my breakfast companions were not alone. Last Chinese New Year, 14 billion digital red packets were gifted through WeChat — 10 packets for every one of the 1.4 billion people living in China. And then someone at the table turned the red packet into gold — by using their red packet bounty to buy gold (probably no more than .01 of an ounce), on another WeChat app. I really don’t know how the gold transaction worked, but if there is a way to trade gold on your phone in the U.S. I certainly haven’t been able to find it. Then there is the rise of quasi-banking in China — all based on the fact that people deposit money on their phones to pay for stuff. Here the leader is Alibaba’s Yu’e Bao (“leftover treasure”), a money market fund with 370 million account holders and $211 billion in assets, with 100% growth in the past year. It is now the largest money market fund in the world according to Morningstar. By contrast, J.P. Morgan Asset Management, a bank founded in 1895, is number two. If China is the present when it comes to mobile payments, India may be the future. Consider two recent developments in India. First, India is today’s global leader in biometric digital IDs. The “Aadhaar” initiative was launched in 2009. Today 1.17 billion Indians (99% of the population over age 18) had a digital ID — complete with a WR code acting like a super U.S. Social Security number, as well as a digital photo, retina scan and 10 digital fingerprints. Second, last year the Indian government undertook an unprecedented “demonetization” — taking out of circulation all at once and with no warning the 500 and 1000 rupee (under $10 and $20) bank notes, estimated to represent 86% of all the currency in the country. Both Aadhaar (for privacy concerns) and demonetization (for slowing down the Indian economy) have been subject to trenchant criticism. But put them together, and they are going to turn India into a digital payments gold rush in the next few years. All the big global players are already there — from both America and China — with some serious Indian players, too. No one knows who will win this global competition, but the recent history of digital payments underlines a key fact. The extraordinary innovativeness of the U.S. tech sector is justly acclaimed. However, it is no longer immune to the forces of globalization and global competition that have disrupted so many other industries in the past few decades. Is It Time for U.S. Citizens to Learn More About the World? The world has long come to America. Now it is time for America to go to the world, writes Wharton Dean Geoffrey Garrett in this opinion piece. Hong Kong’s relationship with China is more sustainable than many think because it is beneficial economically for the island and the mainland, writes Wharton Dean Geoffrey Garrett in this opinion piece. China’s open and supportive regulatory environment, highly developed Internet and e-commerce sector, and growing demand for alternative finance solutions, have allowed the country’s fintech industry to flourish in the last few years. Today, China stands as a frontrunner in Internet finance. By the end of 2015, China’s Internet finance market has exceeded 12 trillion RMB (US$1.79 trillion) and user number reaching ~500 million, according to a new report by McKinsey. More specifically, China’s peer-to-peer lending market currently stands as the largest in the world with transaction volume amounting to 500 million RMB (US$74.7 million). In the financing field, supply chain financing and consumer financing are the two areas that are being the most explored with notable initiatives from e-commerce and retail giants JD and Gome. In wealth management, Alibaba’s Yu’e Bao reached 700 billion RMB (US$104.59 billion) worth of assets under management within two years and currently stands as the second largest money market fund globally, the report says.